Buying a sofa seems straightforward enough - pick a sofa that suits your everyday needs in a style that goes with the rest of the living room - but it's a decision that can be stressful, especially when you factor in the sheer number of options out there and the variety of price points along the spectrum. Fortunately, we have expert help - we asked our own Design Director Jessica McCarthy for her top picks in the market right now. Here are 10 sofas that you can't go wrong with, along with Jessica's professional designer insight on what makes each of them worthy of consideration and what type of room it would work best in. Jessica says: The rich navy color and the solid wood base of this sofa completes the sleek modern look that enhances any room. Perfect for a modern or transitional family room. More information: Wood enhances the look of almost any room, and this sofa from Bed Bath & Beyond is built upon a foundation of solid wood with a pecan finish. This sofa features classic lines that will work with just about any design genre. The cushioning is made of dense foam so you’ll have all the support you need. This is a “live-in” sofa that will work in formal rooms, comfortable rooms, for entertaining guests and for a night on the couch with family watching old movies. Jessica says: This pink stripe settee is the perfect piece for an entry, den, parlor or any living space. I love how this piece is so versatile, with the right room design it can read formal, transitional, farmhouse and even a bit funky! More information: The best interior design pieces are often the ones with which you can do the most. 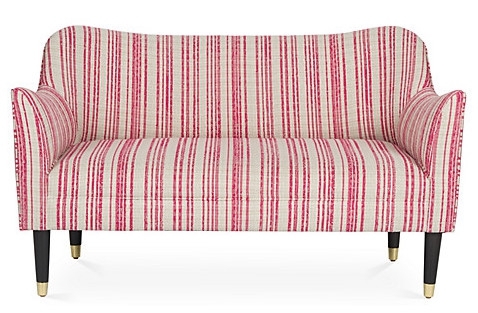 That’s exactly what you’re getting here with this pink stripe settee sofa. You can put it in a formal sitting room. You can add it to your home office design plans. You can arrange it in a living room such that its look will add comfort and style to your overall setting. This is a piece that you can add without really worrying too much about how it’s going to work with the rest of your interior design concepts, as it’ll work with just about anything and it will be comfortable for the long haul. Jessica says: You can never go wrong with brass and velvet. Two of my personal favorite! The lines of this sofa are a mix of glam/mid century modern. Not locking you into one specific aesthetic. Perfect for a modern/eclectic living space with a touch of glam. And the green is so on trend! More information: What if you could combine the elements of a refurbished old classic and all of the sleek looks of a modern sofa in one transcendent piece? You can with this piece that combines two classic elements in brass and velvet with ultra-modern design and durability. Your living room design will look as though you’ve found the perfect match with your sofa, but the truth of the matter is that this is a piece that will work in just about any style and in just about any setting. Jessica says: This leather sofa adds a masculine touch to any space - perfect for a stylish man cave, library, office or study. The channel tufting might be one of the hottest home decor trends this year. More information: Yes, even a man cave needs an element of style. Don’t worry, your man cave design doesn’t need to include things you don’t like. You can add masculine pieces that are not only good looking, but also durable and extremely comfortable. That’s what you’ll get with this sofa from Jayson Home. It adds that element of masculinity to any room, so it’s not limited to the man cave. It’ll definitely spruce up your library design or your home office design as well. Jessica says: The Art Deco curves of this sofa mixed with light blush velvet is the perfect piece for a bachelorette pad, formal living room, New York penthouse or any space you want to add a feminine touch. And, of course, millennial pink another one of my favorites! More information: There’s something to be said about Art Deco design. This is a piece that combines all of the elements of Art Deco design but adds comfort, quality and durability just for good measure. Its unique shape makes it comfortable for several people, and the throw pillows that accompany this piece will only add to your overall enjoyment of it. The Steal - Affordable & Chic! Jessica says: A petite apartment size mid-century sofa providing style for any living space at the most affordable price! Truly great for all those small space living situations. More information: Not every sofa is going to be placed in a large living room, office or library. Apartment couches are part of millions of dwellings across the country, and in many ways apartment sofas are even more important than living room sofas because there are fewer furniture pieces in apartments to balance out the look. This piece offers style, comfort and functionality that will serve any apartment dweller extremely well. You’ll be able to proudly offer a comfortable, stylish sofa seat to company or camp out on it and binge watch your favorite television program on this stylish sofa. Jessica says: From the queen of design, Kelly Wearstler, this is a piece of art in itself. It's a show-stopping sculptural piece that should be in a space where it is center stage. In a formal living room this is sure to be a conversation piece. 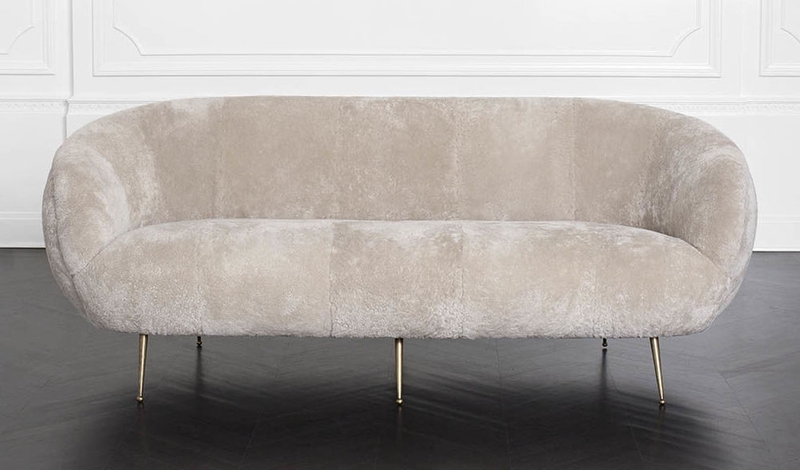 More information: On the other end of the spectrum is this Souffle Settee, which is a piece that draws plenty of attention for several reasons. Living room decorating should start with a sofa like this instead of the other way around. It’s not only incredibly stylish, but it’s just as comfortable. Interior designers love to build a room with something like this sofa as its foundation. You’ll love the look of it and the way in which it seemingly adds value to your entire home. Jessica says: This hot pink number is the perfect and affordable sofa for a first apartment, bachelorette pad, kid's room or for a family on a budget. More information: Living in small spaces does not mean you can’t do so in style. This eye-catching pink apartment sofa is something that’s going to add a lot of flavor to any apartment, condo or efficiency. It’s also quite functional in that it’s comfortable and 81 inches wide, meaning you’ll be able to fit quite a few people on it comfortably. Add this apartment sofa to your living room as the foundation and build the room around it. 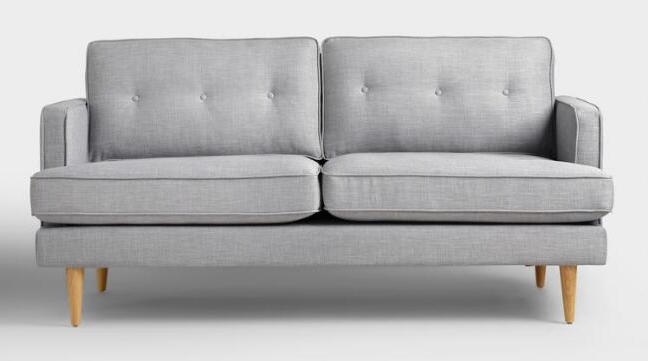 Jessica says: This neutral linen sofa with clean lines is perfect for any modern living space. The brass legs are the unexpected touch that makes this piece so unique. More information: If you’re into modern living, you need a sofa that’s going to match that style. This unique living room sofa is not only attractive, but also sturdy and functional. Its frame is pine, its seat is foam and its cushions are filled with feathers. The brass legs and fabric upholstery complete the piece. It’s a versatile living room sofa that will mix in well with just about anything else you have planned for that room or others in your home. Jessica says: Love this low-slung honeycomb-paneled form is upholstered in sumptuous cotton velvet. Its black nickel base is the perfect finishing touch. Made in Italy, so you know it's top-notch quality. Works well in any space where you want to add a bit of funk. A modern loft, family room with kids. This piece is comfortable while not sacrificing style. More information: There are living room sofas. There are family room sofas. There are den sofas and office sofas and library sofas. This is a piece that could work in just about any of these rooms. It’s going to get the attention of just about anyone who walks in, and it’s going to keep the attention of just about anyone who sits in it. It’s stylish but it’s also extremely functional, meaning it will put up with the daily use that families tend to inflict on their sofas. We’ve just presented 10 sofas we love, but keep in mind that there are thousands out there that may work for you depending on what you want to do and how you want things to come together in your home. Whether you’re undertaking a project such as living room design, home office decorating or anything else, the sofa is a critical piece. If you’d like some help in getting started, ask one of our designers for free at the Decorist Design Bar, or start a design project today!